Glasgow Warriors, a team who produced the standout performance of the opening round of the tournament last week scoring fifty points against Leicester Tigers would have felt confident of producing a performance against a Munster team whose attentions were far removed from the training ground after a traumatic week. Munster had just lost their head coach. Munster had just lost a man who embodied the province. Munster had lost a legend of their club. It is in this backdrop that 26,000 Munster fans assembled. 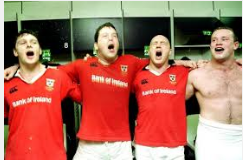 It is in this backdrop where a group of Munster players and management came together and produced a performance which defied logic but rekindled an atmosphere in Thomond Park which has being missing for a number of years. I knew that there was something special about to happen in Thomond Park by the number of fans who were making their way to the grounds at least two hours before kickoff. I was in Raheen at around 11am on Saturday morning and multiple buses with Munster supporters were leaving, the volume of support spoke volumes. Castletroy, a similar story. The locals were going to Thomond Park to support the team, to be the sixteenth man, to provide the guidance to the team in their hour of need. The events leading to kickoff were impeccably executed. The tributes, the sight of numerous Shannon flags in the crowd was a great touch, a reminder of Foley’s connection with the Shannon RFC, a link between the amateur and professional sides of the game in the province. The tribute from the West Stand was sensational; it was an emphatic tribute and the atmosphere around the ground was crackling; it was back to the Miracle games against Gloucester and Sale. Any confidence that Glasgow had going into this contest was gone. The fans had set the fixture, lifted the team and management to new heights. The hunger, intensity and power of Munster in the first ten minutes was incredible; winning the 50/50 battles. The running lines were full of speed and aggression and offloading was on point evident in Earl’s sublime pass to Bleyendaal who with plenty to do evaded several Glasgow tackles and over for a sensational try. The subsequent conversion had Munster seven points to the good. Glasgow were stung, surely there was a reaction coming. However, Munster continued to control the pack exchanges, game line yards were being made, breakdown clearouts were emphatic. A second try was coming and with Scannell making a superb line break, the ball was spread out wide to Jaco Taute who went over, a physical player who needs to be signed long term to the province. The resulting conversion was sublime; the curl of the ball coming in at the last moment, this was going to be Munster’s day. Even a red-card to the hosts could not derail the atmosphere in the venue; it even increased the cauldron atmosphere. Earls tackle was worthy of a red card; loss of control than cynical. Glasgow were fighting a losing battle even playing against fourteen. As Gregor Townsend said post-game, Glasgow were playing 26,000 people, not just 15 players. Scannell at twelve produced his best performance in a Munster jersey; his ability to beat the first tackle was key to the third try as the ball found its way to Simon Zebo who just got over for the try. Axel probably gave him a shove over the line. Another excellent conversion from the touchline and Munster had a 24-3 lead at the break. How could they have this lead? Down to fourteen players. Logic out the window. Glasgow were again on the back foot in the early exchanges of the second half with Munster’s pack to a man excelling in their ball carrying duties and set piece. John Ryan had an inspired afternoon;,,dlodlo scrum time dominance built the platform for Munster to launch penalties deep into Warrior’s territory. A fourth try was inevitable and more pressure on Glasgow’s scrum resulted in a penalty try; reward to the Munster pack. Axel Foley would have being pleased. The inevitable exertions for the fourteen players took their toll in the third quarter and Glasgow suddenly found some form. Two quick tries for the Warriors, the second try was a superbly executed score and highlighted Glasgow at their best; quick ruck ball allowing Finn Russell and Stuart Hogg to orchestrate. Mark Bennett expertly scored and suddenly the gap was down to fourteen points. The home crowd reacted and the players followed suit. A clinically worked fifth try was scored to provide much needed breathing space in the last ten minutes. The Munster pack again to the fore; making several game line breaks and Murray spotting Scannell out wide to go over in the corner. Ian Keatley who had replaced Bleyendaal by then continued to set the tone with a superb kick from the touchline. 38-17. Game over. The crackling atmosphere in the Thomond Park stands and terraces continued until the final whistle as Ian Keatley lashed the ball out of play following a Glasgow knock-on. Mission accomplished but there was one last moment to remember. The Munster players escorted Axel Foley’s sons to the middle of the pitch to launch into ‘Stand Up and Fight’; a massive statement for the players to make. This result was for everyone. Everyone in the ground contributed to the result. Unforgettable memories and one hopes that this is how it will be going forward in Thomond Park going forward. Glasgow Warriors are still very much in this pool. Their attacking rugby will yield additional wins in this tournament but they came up against a force which was almost paranormal in nature. As the great man would say, Munster played with a bit of dog in them. Foley’s charges delivered their most emphatic performance. Erasmus must now identify how to channel this performance in a consistent manner. Epic. One for the annals. Two weeks since Stephen Cluxton lifted Sam Maguire and condemned Mayo to another winter of disappointment, we had Rte trying to be Sky Sports Soccer AM / Super Sunday with players in the lounge area and announcing the 2017 draws. Hawkeye Sidekick casts an eye on proceedings and wonders could the draws be scheduled potentially early in the calendar year. Is it just me or did anyone feel a bit weary heading to the draw ceremony last Thursday night? I think it is a little early to be staging such a draw. The intercounty season has only barely finished and we have this draw; some counties were probably cursing their luck on the draw outcome and potentially will lead to more delays in appointing managers. Munster SHC drew up an intriguing draw with Tipperary and Cork locking horns in the quarter-final. Thurles, the likely venue for this fixture which is a shame as Cork on current form will struggle to contain the Tipperary forward line. Pairc Ui Chaoimh would have provided an interesting backdrop to see if Cork could put pressure on Tipperary given the Premier County’s less than stellar record in the venue in recent times. Waterford await the winners, a season where Waterford will be under pressure to deliver silverware but their style of play needs to be more attack based. Will Derek McGrath take the shackles of Waterford next season and if so, will it open up defensively weak points in the full back line? Tough side of the draw and it is a massive opportunity for either Clare or Limerick to get into a provincial final and playing deep into next summer. Clare have plenty to prove; a brilliant NHL campaign petered out badly in the summer with underwhelming performances against Waterford and Galway. A distinct of physicality was exposed down the spine of the team and defensively were all at sea in the All Ireland QF loss. Big onus on Donal O’Grady and Ben O’Connor to provide the direction to the new management ticket to get Clare moving upwards immediately; otherwise a difficult season awaits. Limerick. A true hurling enigma. John Kiely has his work cut out on both defensive and offensive areas. The back line lacked leadership in the half-back and full-back positions. When you add the sheer lack of quality ball into the full forward line, it was an abject season for Limerick. The attacking lines lacked cohesion and ball winning ability as well, something which needs to be addressed immediately. Potential Limerick club involvement for Patrickswell if they win the SHC title next weekend will do little to resolve these issues. Tipp or Waterford to be favored with Clare potentially as a dark horse to win the crown. Wexford and Davy Fitzgerald will be either relishing or filled with dread over this draw. A potential last four tussle against Kilkenny will be a true acid test of where the Model County are in terms of progression under the Clare hurling supremo. Kilkenny will be competitive; one loss does not make this team a bad one but the quality of panel last season was not up to par and it was ruthlessly exposed in the All Ireland final reversal. The defensive problems could not be addressed as the KK management simply did not believe they had the personnel on the bench to stem the Tipperary tide. Wexford will be hindered potentially by a long All Ireland club run for Oulart with several players missing for NHL 1B selection. Wexford will hope for an extended qualifier campaign; looks like a transitional year for Davy Fitzgerald. Dublin and Ger Cunningham are under pressure already. No Danny Sutcliffe again next season and the prospect of facing a resurgent Galway outfit in the quarter-final does not bode well. Unless Dublin can identify two scoring forwards to complement David Treacy and allow Liam Rushe to control games at half-back, they are going nowhere. I am stunned that Dublin did not go all out and secure Davy Fitzgerald’s signature as Cunningham’s rein has flattered to deceive in the last two seasons. It looks like Kilkenny and Galway for the final decider. Kerry to cause an upset or two in the qualifier but the status quo in the province will remain. Limerick County Football board will find it hard to attract any interest in the senior managerial job after this draw. With a resurgent Clare first up, the prospects do not look good for the Division Four outfit and with the perennial provincial powerhouse of Kerry in the semi-final, it is looking like a fairly predictable result sequence. The other side of the draw is intriguing. Waterford are in the same boat as Limerick footballers unfortunately. They are lambs to the slaughter and it is down to Cork and Tipperary footballers. Tipperary were a revelation in the championship last season; their open brand of football and kick passing caught the eye. The prospect of traveling to Pairc Ui Rinn may tilt the balance to a Cork side who will be keen to make amends for last season; expect Cork to edge through with Aidan Walsh playing a prominent role in the midfield area to get to the provincial final albeit Kerry look favored to advance as province winners if the nucleus of the panel and minor additions gel together. Johnny Cooper was comedy gold when reacting to Dublin’s tasking opening round assignment of Carlow or Wexford. The ‘treat them with respect’ GAA line was out before you knew it and Brolly was in his element. Dublin should travel to either venue for this contest. Kilkenny last season was a great occasion. Dublin on paper look too good for anything in this province. Kildare or Meath potentially will be in the final but either possess the attacking threat to seriously threaten Jim Gavin’s charges. McEntee’s introduction as Meath manager is a good appointment for the Royals but this is a work in prospect. The rest of the teams look under-par and a good league run may be the amount next season for the vast majority of Leinster teams. A sad indictment of where Leinster football is at. The underage success of the likes of Kildare and Meath in recent years cannot be transitioned quick enough to senior ranks. There is potential of two shocks in the Ruislip and New York. Sligo look vulnerable heading to the Big Apple; their London reversal a couple of years ago does not inspire confidence and if they have to contend with Armagh’s Jamie Clarke in the NYC team, an upset is assured. Leitrim travel to London and it is a 50/50 contest. Roscommon will cruise through to the provincial final but with the managerial unrest far from being resolved, precious pre-season training plans have being wasted. Kevin McStay is under the microscope and it will be interesting to see if Roscommon can address the lethargic performances offered up in the championship this summer where they lacked cohesion at both ends of the pitch. Galway and Mayo is the standout tie of the championship in the province. Salthill will be buzzing; hard to know who will emerge victorious. Will Mayo provide the same intensity seen in the All Ireland final? Will Galway address the defensive problems which were exposed against Tipperary? An interesting championship awaits but will stick the neck out and say Mayo for the provincial honors. Can Derry and Armagh get their panel problems sorted in time fot the championship? It is a defining season for Kieran McGeeney who after a wretched last season will go to rebound in the NFL and Championship. Derry’s player unrest looks ominous for Damien Cassidy and considering how porous defensively they were, it looks like Donegal vs. Tyrone in a last four tussle which could go anyway. Monaghan look to be the dark horse of this championship. Conor McManus is the difference between Monaghan and the rest of the teams in their side of the draw. Cavan have a bit to prove in the NFL Division One to be realistic province contenders. Donegal and Monaghan to contest the final with the Monaghan boys coming on strong to win the provincial honors.